Since 2005, Dr. Nicholas Fogelson has been working as a fellowship-trained gynecologic surgeon and physician. 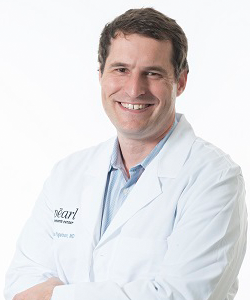 He came to Pearl Women's Center from Emory University, where he headed the department’s pelvic pain and endometriosis programs, led ventures to enhance minimally invasive gynecologic surgery, and operated as the Chief of Gynecology at Grady Memorial Hospital. Dr. Fogelson’s expertise has been well established in his proficiency in endometriosis resection and in his abilities for treating complicated cases that demand multi-specialty collaboration and innovative techniques. His broad experience in all areas of gynecologic surgery have allowed him to develop and perform minimally invasive techniques for almost all of his surgeries, including in many operations that would normally necessitate sizable incisions to complete. Dr. Fogelson’s commitment to innovation and excellence in surgical methods is frequently seen, both in his own work and by those who he has educated and inspired through his practice. Not only has he lectured at regional and national stages throughout his career, but he has also published numerous peer-reviewed articles. Dr. Fogelson’s enthusiasm for contributing to the community and caring for all his patients shines through in his work. His contentment and knowledge in all aspects of gynecologic care allow him to be available to help with all matters of varying complexities, from complicated referrals to well-woman exams. Outside of caring for his patients, Dr. Fogelson finds passion in listening to great music, spending time with his wife and daughter, and playing competitive golf in local and regional tournaments.